To prepare for your child's first visit TayKimTan's Fun Town Play and Party Park in Niagara Falls, please review our Park Rules carefully. Your children's safety is our top priority. At TayKimTan's Fun Town, we want everyone to have fun and be safe! The staff at TayKimTan’s Fun Town is not responsible for your children during open play hours or private events. Unless you sign them up for our awesome Summer Camp – then you can leave it to us and we will ensure your child's safety and fun! We can not be held responsible for any injuries that may occur within our indoor playground. When entering, you play at your own risk. All rules must be followed for your own safety. Socks or slippers a must. No shoes allowed. This rule applies to everyone. We do not allow anyone to wear shoes any where after our reception area. There is plenty of bench seating for you to remove and store your shoes. Everyone must have socks or slippers to enter the play area. If you forgot socks we sell them for $2 a pair at our concession stand. TayKimTan’s Fun Town is not responsible for any lost or stolen personal items. No outside food or gum chewing allowed. We are a Nut Aware Facility. All food must be consumed in eating areas, and under no circumstances is food or gum permitted on the play structure or carpeted areas. Exceptions are made for baby bottles and baby food. Please respect and help keep our playground clean. All tables are for anyone to use, but we ask that you clean up after yourselves. Be aware that you may be asked to vacate the area if TayKimTan’s Fun Town staff needs to prepare for any private function. Please put garbage in its proper place; garbage cans and recycle bins are clearly located throughout the play park. Keep your eyes on your children at all times. TayKimTan’s Fun Town is not responsible for watching children. No pushing, fighting, coarse language, or bullying. Please report any suspicious or unacceptable behavior. We respect everyone and expect all our guests to respect each other and our equipment. It will be up to TayKimTan’s Fun Town staff to ask anyone not respecting our equipment or our guests to stop such behavior. Failure to do so will result in asking anyone being disrespectful to vacate our property without refund. Use caution when playing, and use equipment properly. Feet first down all slides. No climbing up slides, and please keep the bottom of the slide clear at all times. When riding bikes everyone must go in the same direction, no bumping into each other or the surrounding fencing, bikes must be kept in designated area. Helmets are available at your request, and are located in our reception area. Please report any suspected damage of the equipment immediately to a staff member. Take turns and be fair. Some areas have limited space. Share the equipment, toys and books, and make sure everyone gets a turn. TayKimTan’s Fun Town is not responsible for any injuries that may occur. Do not attend if you feel sick. TayKimTan’s Fun Town disinfects all equipment daily. We are proud of our facility and we would like it to stay in a like-new state. We take pride in assuring our equipment remains clean and safe. We understand little ones can have accidents, so please inform a staff member immediately so they can promptly clean and disinfect the area. 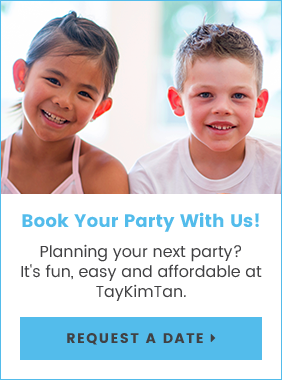 Please be aware that TayKimTan’s Fun Town has a regulated occupancy level and that we will close for private functions. Re-admission is allowed through out the same day. Have fun!